Please Select Valid Pick Up date. Pick Up Date should not be a past date. Drop Off Date should not be a past date. Please Select Valid Drop Off date. Drop Off Date should be greater than Pick Up Date. Please enter new Drop Off Date. Sunday is not working day. Please enter new date. Your requested dates do not meet our minimum hire requirements. You must select a minimum of 1 days hire. Please re-enter a new date. Sunday is not working day - Please select new date. Tick this box if you'd like to hear about our special offers and promotions. The age limit stipulated here is the minimum age requirement needed to be able to get insurance for you on this vehicle. Unfortunately, if your age falls below this restriction we may not be able to hire the car to you, however there are exceptions, subject to terms and conditions, which we are more than happy to discuss with you on an individual basis. Each car comes with a daily allowance of 100 miles, which means you can drive 100 miles per day with no additional cost to you. However, should you exceed this allowance, this fee will be charged per mile. This is a daily administration fee charged per day applicable should you wish to include additional drivers to your rental. 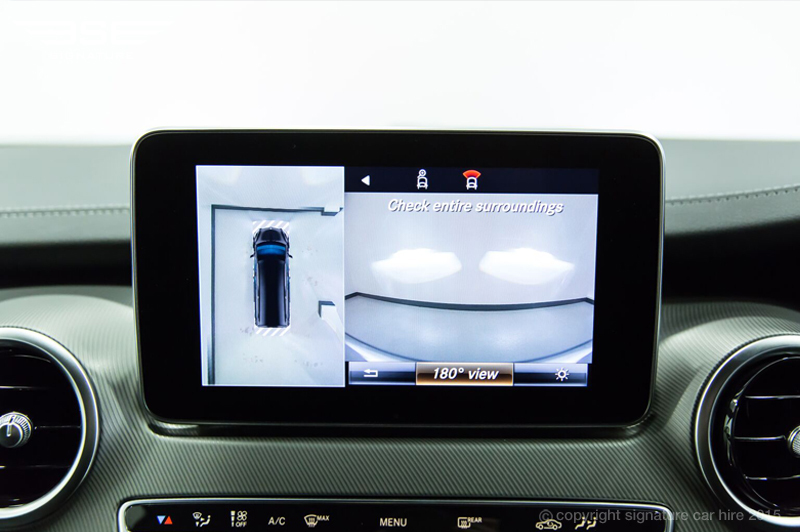 This is the amount of security deposit required from you when booking this car. The amount is not taken as a payment, but reserved for the duration of the hire. The deposit is automatically released by your bank up to 5 days after the return of the vehicle to us. In the event of any damage to the car, we will evaluate the costs for repair and contact you before proceeding. All our prices are clearly listed above on a daily rate basis and we regularly check competitor prices to ensure we are offering you the most competitive deal. 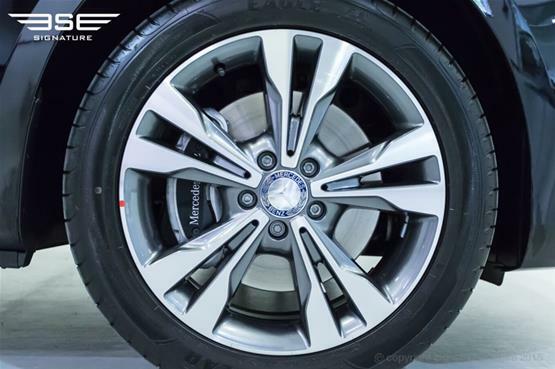 In addition we offer special offer rates for regular hirers, ask our sales team for more details. It's not only F1 cars for which drivers can't be over 6ft - a lot of road cars also make you choose between performance and space. 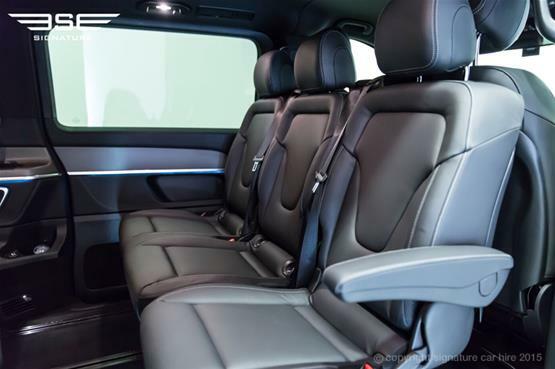 The Mercedes V-Class, however, proves that space is a luxury that can be acheived without compromise: not only is it quicker than all its MPV rivals, but it's more efficient, better equipped, more luxurious and more comfortable than them too. 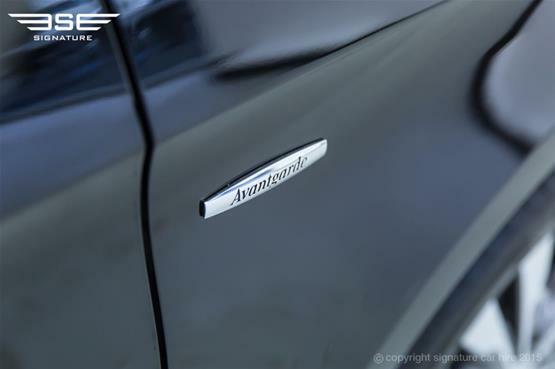 It's due out in 2015, and we expect huge demand from people looking to transport large groups in luxury and style. 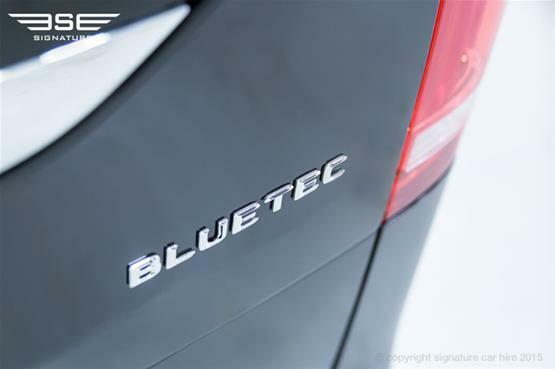 The V-Class contains a 2.1 litre diesel engine - which can produce up to 480nm of torque - coupled with a 7G-tronic automatic gearbox. With a top speed of over 120MPH, the car is certainly no slouch, and steering wheel-mounted paddles make it easier for the driver to acheive peak performance. 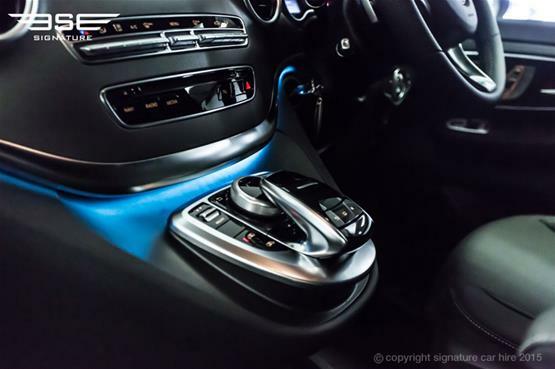 There are four driving modes to choose from, Eco, Manual, Comfort and Sport. 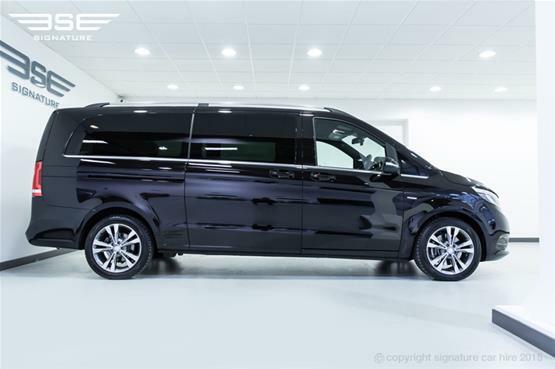 As you're likely to be riding in the back of this spacious car while our chauffeur does all the hard work, you'll undoubtedly benefit from Comfort mode, which gives a perfectly smooth ride thanks to adaptive dampers that constantly adjust to the road surface. 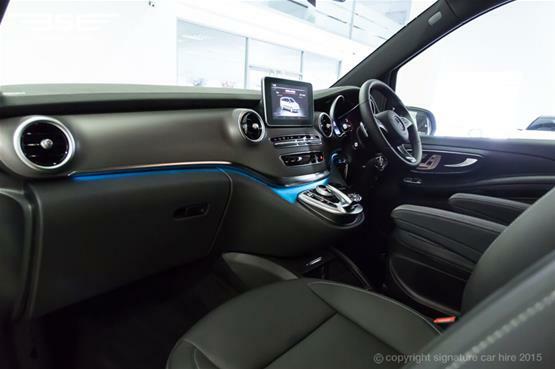 Mercedes are renowned for being market leaders in technology that promotes driver performance and safety, and this certainly shines through in the V-Class. There are an impressive eleven driver assistance systems in this vehicle, including Crosswind Assist, Attention Assist (which tells you when the driver is dropping off to sleep), Lane Keeping Assist, Collision Prevention Assist and Blind Spot Assist. 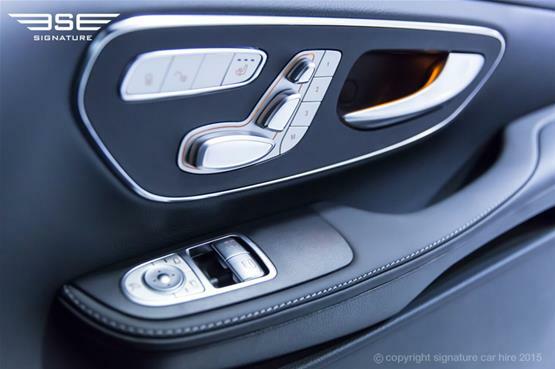 We can't really explain the versatility of this spacious vehicle better than Mercedes do themselves: "Whether off on a shopping spree or travelling with the whole family, heading out for a mountain bike holiday with friends in the Alps or driving prominent guests to a red carpet event: the new V-Class provides optimum flexibility when it comes to use of the interior and always cuts an elegant figure at the same time." We can, however, add the icing on the cake - thanks to Signature's chauffeur service, you can enjoy all the perks of Mercedes V-Class hire without the need to do any driving. 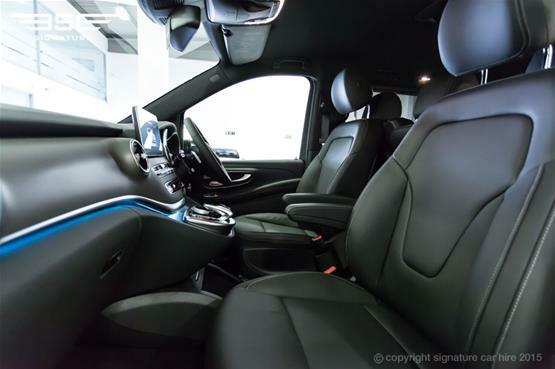 Just sit back, stretch your legs in the spacious gaps between seats, and let us do the hard work! The spacious interior of the Mercedes V Class we have for hire is a very inviting sight. 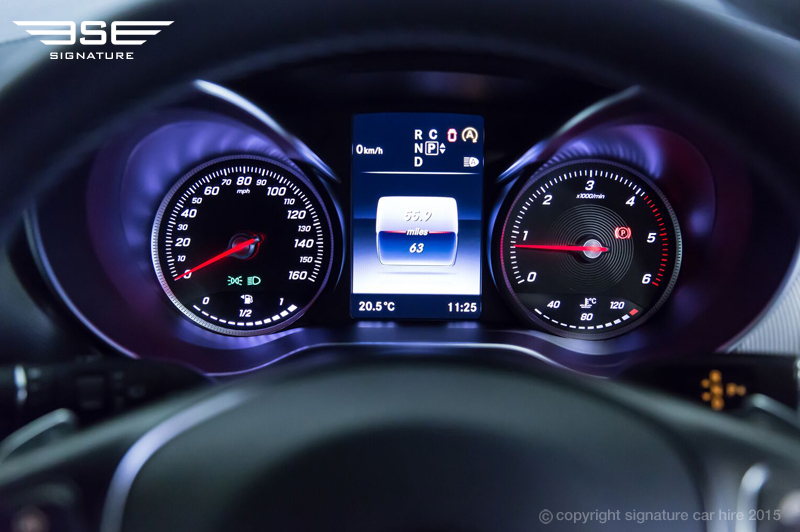 Up front you have a glossy new dashboard, delicately curved and trimmed with the highest quality wood. 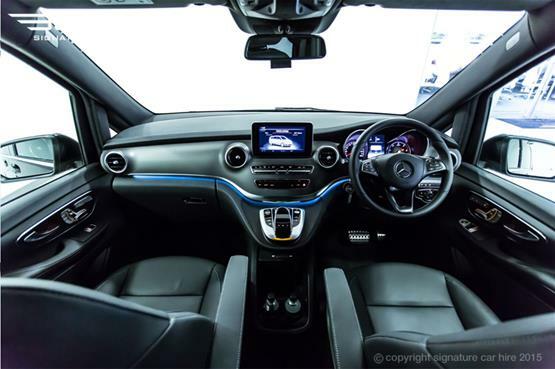 Contained on the dash are chrome-rimmed instrument dials and a centrally positioned seven-inch infotainment system with a touch-pad controller - which Mercedes fans will recognise as borrowed from the new Mercedes C Class. 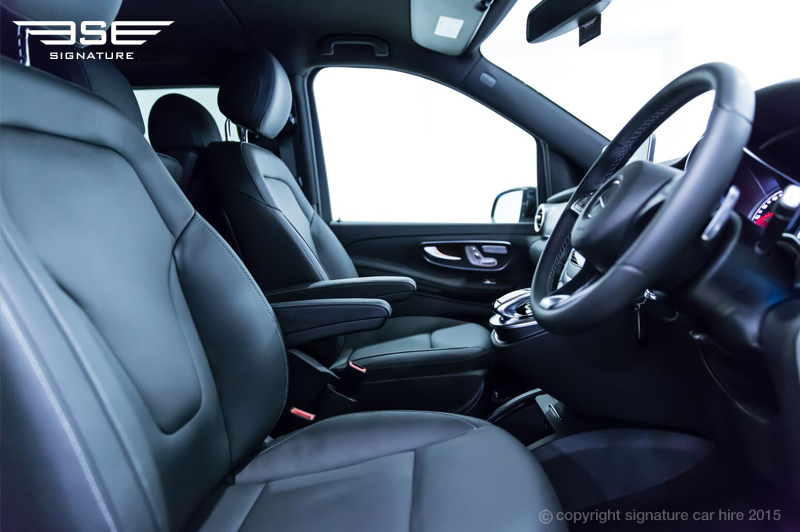 Those up front benefit from captain's chairs with adjustable heating, but it's the seating configuration at the back that will make this such a popular hire choice. You can seat up to eight people in the V-Class, thanks to the option of having two 3-seat benches in the back. 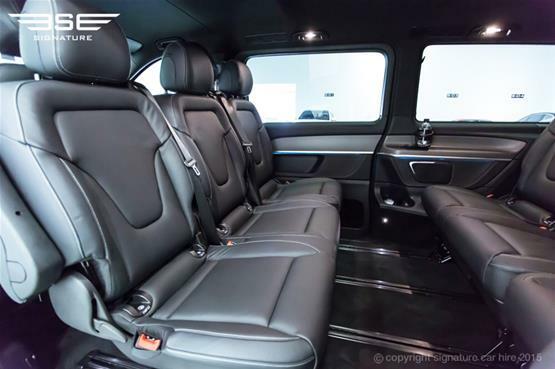 There's also a seven seat option, or - which is undoubtedly best for business meetings - you can opt for the six-seat option that allows rear passengers to sit facing each other, thanks to the inclusion of four individual leather chairs, designed for versatility and comfort on those long journeys. All seating options come with nifty railings - meaning that seats can be easily slid along the car's floor to create more legroom as and when necessary. 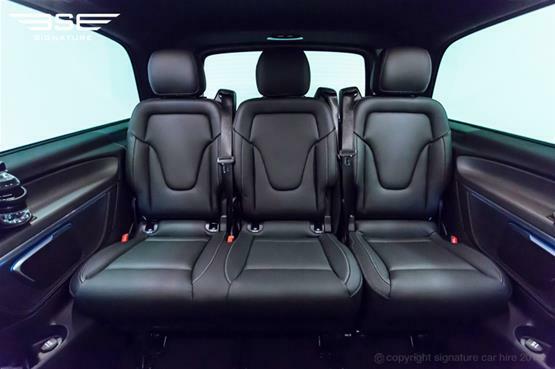 Not that legroom will really ever be an issue, given that the V-Class is a whopping 537cm long, but you could probably get away with packing the kitchen sink if you ever needed to! 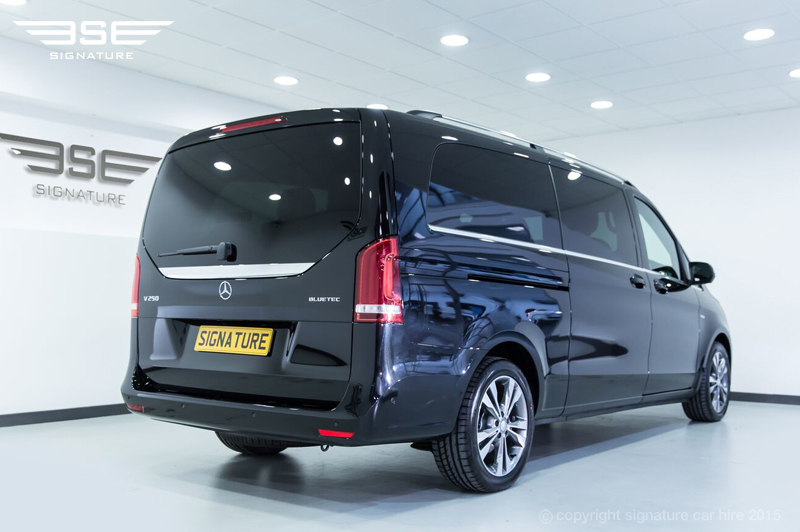 Proving that it's absolutely designed with passenger comfort and convenience in mind, the Mercedes V Class even has a glass hatch as the top half of the boot door, meaning that you can access the parcel shelf and top parts of your luggage with great ease. 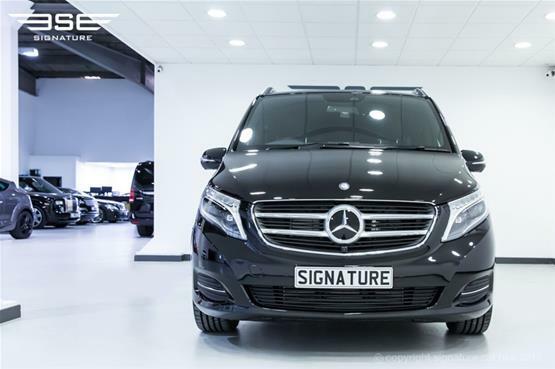 Even with its van-like proportions, the Mercedes V Class is unmistakably part of the updated Mercedes family. 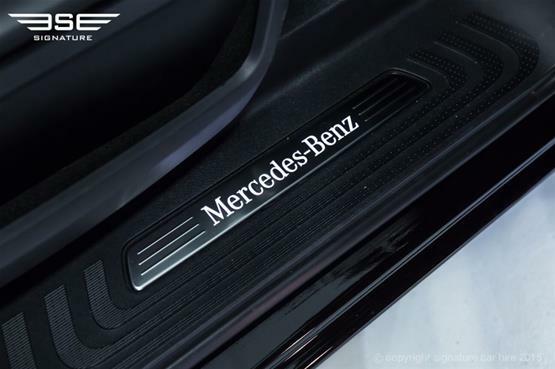 Headlights are LED, sit at the base of a v-shaped bonnet, and bookend the large front grille, which is surmounted by a bold Mercedes badge. The car's sides feature electrically powered sliding doors and large passenger windows, while the key feature of the rear is the large tailgate, to which the huge glass window above, which can be opened independently, provides a striking contrast. This 2015 vehicle isn't the first car to have used the name 'V-Class'. In 1996, a V-Class model was introduced as a primarilly commercial vehicle, which was based on the Mercedes Vito. The Vito remained in production until 2004, when it was replaced by the Mercedes Viano. 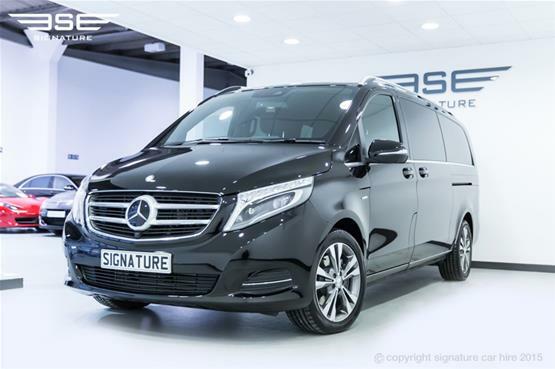 The Viano, however, was fraught with problems and the V-Class now represents Mercedes' attempt to step up to the plate and prove that their concept is viable in the increasingly luxurious MPV market. 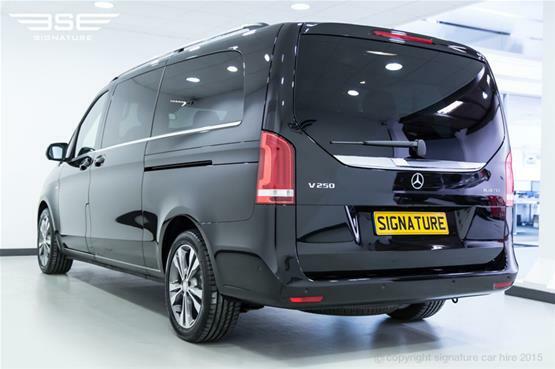 The new V-Class keeps some of the Viano's underpinnings, as well as the core engine, but has a much sleeker profile, longer length and much more attention to quality, comfort and style. To find out how you can join the waiting list to experience this unique vehicle for yourself, please telephone our Experience Centre today. To hire our Mercedes V Class on a self-drive hire basis or with our chauffeur service, call us direct on 0845 370 2222 today. By subscribing to our company newsletter you will always be up-to-date on our latest fleet additions, news and promotions! Invalid Email Address. Please specify again. Copyright © 2005 - 2019 Signature® Cars, all rights reserved. 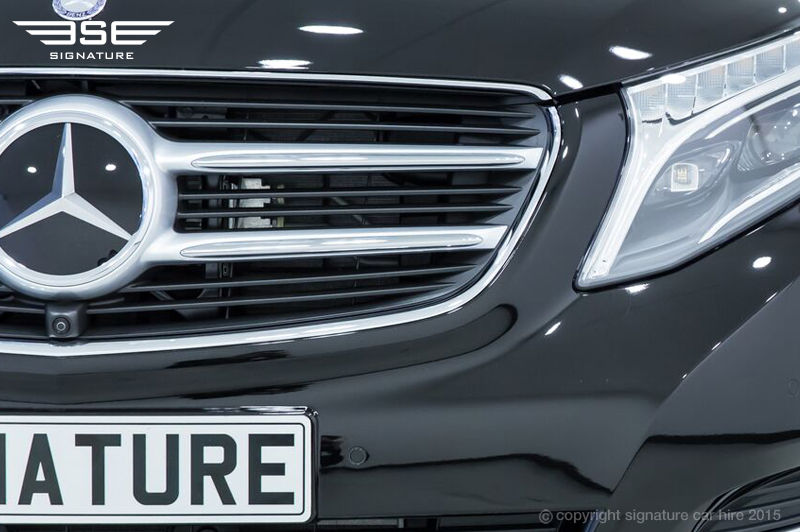 Signature and the Signature logo are registered trademarks of Signature Car Hire Ltd.